Apple has launched the iPhone 5 with everything that could beat all the competitor devices, with the advancements in all the aspects – Screen size, Processor and a lot more things. The Apple iPhone 5 has come in with a 4-inch touchscreen, and the device has become taller and is now the thinnest smartphone in the market, with the thickness being just 7.6mm. Apart from that, the operating system has got an update, the phone has got a new connector and there is a support for the 4G LTE connectivity too. Let’s talk about the main features that the Apple iPhone 5 would be always talked and boasted above. The Apple iPhone 5 is made thinner from the 9.3mm to 7.6mm, making it the slimmest smartphone ever, and along with that, it’s very light with a weight of just 112gm. The new iPhone has now got a new connector, called Lightning and it has an 8-signal design and would come with an adapter. 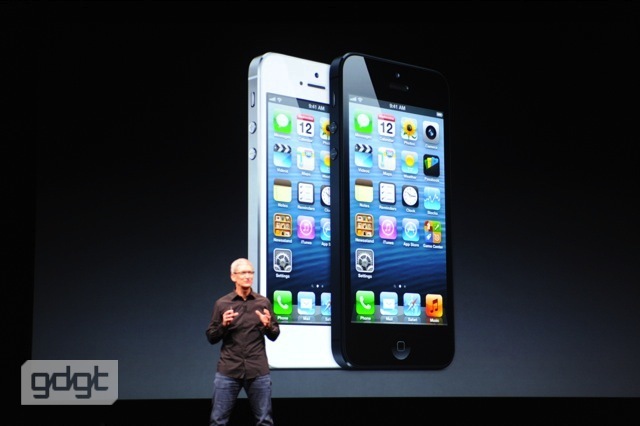 It is made of glass and aluminum and the iPhone 5 comes in White and Black colors, with the Silver Aluminum finish. The capacitive touchscreen of the iPhone 5 is of 4-inch size and has a resolution of 1136 x 640 pixels. It is the same retina display, which has just got taller. The display itself has got an integrated touch sensor, and there is a 44% increase in the color saturation to make it one of the best displays around. With the new phone, comes the new software. Apple iPhone 5 comes with the iOS 6 operating system and there are over 200 changes made from the previous version. The interface would now have 5 rows of App icons, and 4 shortcut icons in the bottom. The maps have been made better, Siri has been integrated into a few apps, and the FaceTime app can be used from anywhere and not in just the places where Wi-Fi was needed previously. The rear camera of the Apple iPhone 5 has got the 8-megapixel sensor and a lot of changes. 3264 x 2448 pixels would be the picture resolution, and the photo capture can be made better with the inclusion of the features. The video recording is of 1080p HD quality. There is video stabilization, face detection and option to capture a picture while the video is being recorded. The FaceTime camera on the front side too can capture 720p HD videos. The Apple iPhone 5 now boasts the A6 chip, which doubles the performance and speed of page loading and app loading. Many functions in the iPhone 5 would be more than 1.5x faster than earlier. The battery is said to provide 8 hours of life for either the 4G LTE browsing, the 3G browsing or calling. That’s good enough to match or better the iPhone 4S battery life. The iPhone 5 would now support the 4G LTE networking, and the Wi-Fi a/b/g/n. Apple is tagging up with all the network operators who have started providing the 4G networks for subscribers. The Apple iPhone 5 is going to be available from next week but the pre-ordering starts from Friday. Here are the prices of the Apple iPhone 5 and the previous iPhones. The Apple iPhone 5 is coming in the White and Black colors.